Ah how lovely... nearly two tube and work free weeks have gone by and how do TfL welcome us back? With a price increase of 6% or more and some delayed running services. This morning I paid my £106.00 with only a little gulp as this will not only cover a month of work journeys but also my numerous navigations across Zones 1-2 for various social callings. I know, however, there are many who do not benefit as much from their season tickets and no matter how many journeys you make £106 is still £106. After living in and around London for most of my adult life I have learnt that there are those London residents who applaud London Underground, and there are those who abhor it. I am a member of Team Applaud. I believe London would be a drastically different place without it. I almost can't quite imagine a London with no Underground. Not only would we be lacking in hundreds of points of reference but I would go so far as to say the population would be greatly reduced (one point for the Team Abhor?) and our approach to travelling across our vast and overwhelming city very different and cumbersome. In brief, whether you like it or not, use it or not, London wouldn't be the London we know and love (most of the time) without the London Underground network thundering along under us. I have previously blogged about the excellent public transport links in and out of Shepherd's Bush, but in my opinion our greatest transportation asset has to surely be the Central Line. Every morning on auto-pilot I join the herd who descend under Shepherd's Bush tube station to play seat-lottery and head east to jobs in the City or the West End. 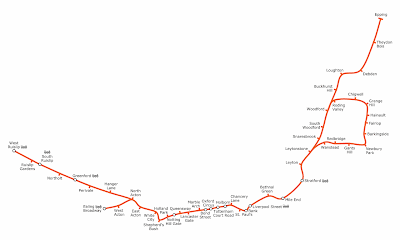 I have learnt that the very journey I do (Shepherd's Bush to Bank) was the actual original length of the Central Line or the Central London Railway as it was known when it opened in 1900. I am filled with a sense of nostalgia thinking that people have been making the same daily journey I do (to seek their fortunes as grumpy and glum faced as we are) for more than 100 years. Considered one of the "Deep Level" tube lines it is the fastest on the London Underground network, for which I am very grateful as my average commute is a very civilised 35 minutes door to door. Every day as I alight the train at Shepherd's Bush, I observe the flock of people that come with me and am confident that many of them are West-East commuters like myself as opposed to East-Westfield shoppers. I think this post has to make a special reference to the staff at Shepherd's Bush Central Line station who are mostly a great asset to Transport for London. My friend SJ has often confirmed this to me when she presents herself there as a VIP (visually impaired person ...AND very important person I like to think). In particular there is a very jolly man (I think he is called Martin) with a soul-warming Caribbean accent who I unashamedly make a bee-line for when queuing for my monthly renewal (another point for Team Abhor - the automated machines have let me down on more than one occasion). He is quick to chat, to joke and even to flirt a little which personally I think at 7.40 in the morning should always be applauded. I know many will have a different opinion of the Central Line, the London Underground and Transport for London in general. Maybe it's because of my new year's resolution of seeing the cup and my life as half full, but I applaud the Central Line for 90% of the time getting me to and from work in a speedy, efficient and only occasionally crumpled and crushed fashion. Central line always seems the quickest, and most frequent line there is. £106 is a VERY high price to pay though. And with now more traffic congestion inevitable west of Marble Arch due to the 'C' charge extension being scrapped, buses (my preferred method of travel) will take longer and longer to get into town. It could see an upsurge in bicycle use though, which is never a bad thing. I'm glad to see some positive comments about the tube. The main problem with the tube is that it is a victim of its own success. S - Thank you for reading and commenting. I think you are right...it grew too quickly and too long ago for there to never ever be any problems.